Where do you get ideas for writing projects? Writing is work that starts with an idea. Coming up with fresh ideas for writing projects can be a challenge, especially good ideas. I’ve come up with several strategies for identifying ideas. Some of the approaches work well for blog posts but not for novels. Other methods may be useful for writing a nonfiction book. Not having a good idea for writing project results in a whole lot of written words that don’t add up to anything worth reading. Start out with a boring idea, and you can write a million words and still not have a workable novel. Writer’s block, in my book anyway, is a very different problem. Writer’s block characteristically happens when you have an idea, sit down and stare at the blank page, but you can’t find any words to say. I will save the topic of writer’s block for a subsequent post. Today some thoughts about how to get ideas in the first place. These are approaches I use, and if you have others, please leave a comment. You can’t drink from an empty glass. I’ve discovered that before I can write anything worth reading, I first need to fill my brain with ideas. I subscribe to more mailing lists that I can possibly read. As the newsletters come in, I sort them, unopened, into some file folders. Mental health material goes in one file folder. 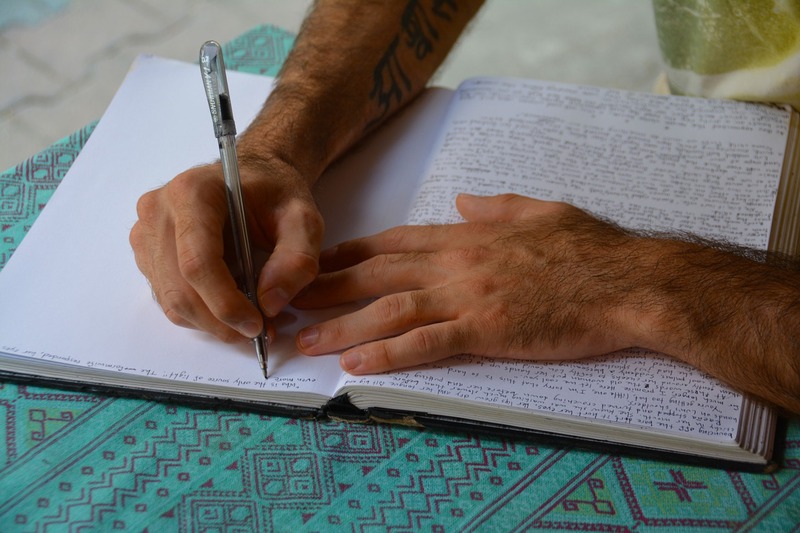 Articles about writing in another. Publishing and marketing have their own separate folders. When I’m looking for ideas for blog posts, I will go to a file folder and start reading. For me, I find it useful to follow the clues. As I’m reading along an idea pops up. Usually, it’s something I realize I don’t know that much about or don’t have the information I would need to write a blog post. I record those ideas, especially search terms in a Word document titled, strangely enough, blog post ideas. Once you have a topic go on a scavenger hunt. Sometimes reading a stack of newsletters will trigger ideas worth a blog post or even a series. But more often what I come up with is a topic. This happened to me recently when I discovered several blog posts about burnout. Lots of people are dealing with burnout. Which raises the questions why so much burnout, and how do you prevent burnout? Having the topic leads me to look for available resources. For a nonfiction topic like burnout I go to scientific journal articles, look at the research. Fortunately for me, I have a subscription to a scientific journal database. Before I had that subscription had to go to the University library and use their computers. Next, I search that database. Frequently the search will return tens of thousands of articles. The ones at the beginning of the list are usually much more relevant than the ones in the last thousand. Typically, I read through the titles and descriptions of the first 100 articles, saving copies of the ones that look interesting to a flash drive for later reading. Over the next few days, I’ll read articles, making notes as I go. I’ve learned if I’m not careful I get notes but can’t find the original source. As a result, I started keeping the notes in an electronic Word document beginning with the citation of the article followed by my notes. Once I’ve read enough of the articles to feel I have a grasp of the subject I make up a list of possible titles for blog posts. Then I start writing. The good part of the system is I get a lot of ideas. The bad part is I have a lot of half-finished articles that never made it to the finish line. Using this system, I often end up with not one post, but a series of posts on a topic which I scheduled to appear over several months. Read lots of books in your subject area. My office is full of books. The walls are lined with bookcases filled to overflowing. Sitting next to my chair is a stack of books I bought, saying I would read them someday, but never got to. When I’m short on ideas, I look through the pile, pick the book that seems most interesting and start reading. Often reading one book on the topic triggers other questions. I then go searching for other books on the same subject. Sometimes I go to the library in hopes they have a book I don’t. Online library catalogs to be especially helpful. For a novel I was writing I decided I needed some specific background information. A quick web search didn’t turn up the information I wanted. But my local library was able to get me a book from another library that provided a lot of background information for the historical period I was writing about. For me, one thing always seems to leave to another. Everything you encounter can trigger an idea for the next thing you’re going to write. Don’t passively consume experiences. Be curious. If you’re watching a TV show, ask yourself what else could have happened. Be interested in the places you go and the people you meet. Any of these situations may be just the idea you need for the next piece you’re going to write. Make friends with your muse. A lot of prospective writers seem to have a very conflicted relationship with their muse. When they don’t have an idea, they blame her, and they look very reluctant to go anywhere or do anything until she appears. When they can’t find an idea, they blame it on their muse and sit idly by waiting for her next visit. My muse and I have a very odd relationship which I will tell you about in an upcoming blog post. Thanks for reading. How do you keep the creativity flowing? If you work in a creative field, then you know how important it is to find ways to spark your creative flow. Every profession these days could use a little creativity if that person or firm wants to prosper and grow. Sometimes to create the life we want we need to be more creative in our homes and leisure as well. So how do those super creative people do it? No, the answer is not drugs, nor is it working longer hours. More effort put into doing something the routine way will not result in creativity or new approaches. If you need some inspiration to spark that creative fire of yours, here are a few suggestions. Look for inspiration in new places. If you keep looking in the same place you keep seeing the same things. Two possible solutions, look in new places or look in the same place with new vision. Travel exposes you to new surroundings and customs. It can give you a fresh perspective. Visit a place you haven’t been to before or a place you haven’t been to recently. Consider how someone from another occupation might look at the problem your working on. Writers are encouraged to read other genres. A designer might look at natural history specimens to find inspiration. A walk in nature can inspire other ways of looking at things. If you continue to go to the same places, with the same people, you see the same things. Expose yourself to novelty to see the world with a new set of eyes. Creative people in any discipline are on the lookout for new ideas and they are almost always willing to share. Some great ideas for innovation in business came from watching what was going on in other industries. Artists in one medium can find inspiration by looking at the work of artists in other mediums. A photograph can be an inspiration for a short story or setting for a novel. Getting out of your comfort zone and having new experiences can free up the mind from the same old way of seeing things and get that novel way of looking at the problem to come into focus. Having a problem with a creative issue? Try asking other questions. How might a biologist approach this question? How would an accountant or lawyer see the creature you are creating? If you are not getting answers to questions requiring creativity ask different questions. Work the process, put in the hours. Some creative projects require you to get moving and do something. Writers with so-called “writer’s block” are well advised to write, write anything. That first effort may not even be worth saving but it will get you started working in the direction of the finished result. Sometimes creativity includes experimenting with things that won’t work until you have eliminated all those possibilities. Approach each new attempt at creativity with the mindset that you will discover all you can in this process. Take some breaks. Shift gears. If you find yourself doing the same thing over and over and getting nowhere, try working on another project. Take some short breaks and do something else. While you are washing the dishes or emptying the refrigerator the solution to your who-did-it or how the murder needs to take place may pop into your brain as if by magic. This taking the break is not an exception to the rule before putting in the hours. Taking short breaks to shift your thoughts is part of the putting in the effort process. Be careful here to avoid things that are just distractions and find ways to get your mind into neutral during these breaks. Identify the things getting in your way. Identify roadblocks to creativity. Are there distracting noises? Change locations. What others things might be impeding your creativity. Is your work area uncomfortable? Consider what other supplies or equipment might help you improve your creativity. Are you lacking the information you need to do the job you’re trying to do? What other information might be helpful and how will you go about finding it? Sometimes it’s as simple as your mind is occupied with something else you will need to do at another time. Plan for when you will do these other activities or consider writing them down and making a list so you can free up space in your brain to get back to the task at hand. Forget the rules and use what you have. Rules about how things need to be done get in the way of being creative and inventing a new better way to do or make them. The overly rigid about how things have to be done, what tools are needed or how to use them can get in the way of creativity. Try using new tools in new ways. Often creativity comes from trying out new tools, ones you’ve never seen or used before. Try to get out of your reaching mindset and use the tool you do have in new or different ways. Tools and working your tools can be used in a great many ways beyond what we initially think. Consider what new tools you might want to try or how you might want to use your existing tools in a new way. Creativity is all about moving outside your comfort zone, seeing things in new ways while being willing to try new options. Extremely creative people nurture their inner child. What is an “inner child” and why do we say that you need to get back there to foster creativity? The idea of “inner child” work comes and goes. I think of an inner child as a developmental process. When you were young you were more in touch with feelings, more aware of not knowing things and maybe more open to experience. Many of our adult problems come from lessons that we learned or failed to learn as we grew up. If something happened to you and you concluded that was the way the world was, then from then on you lived your life based on that belief. As a child for whom everything was new, you were more open to new experiences. Creative people practice returning to that place of not knowing and are more readily able to see things from new perspectives. If you can suspend your beliefs about what is and what has to be then you can see what might be. Here are a few ways in which a childlike view of not knowing, allowing your thinking to return to a more childlike or inner child state can boost your creativity and help you find new solutions to life’s challenges. Children, early on, do not have fixed beliefs or interpretations of why things are and why they happen. The small child’s favorite question is why. The older we get the less we think about things. We come to believe that things are always the way we think they are. We adopt a stance of always knowing and become reluctant to admit we don’t know. We stop asking the why questions. Practice each day asking yourself why? Why do things happen? Why do we do things this way? Remember to also ask “What” questions. Look for what could be that you have not created yet. The dream state is one in which all things are possible. The laws of time and space do not apply in the dream. In daydreaming things that appear unconnected may suddenly reveal their connection. Daydreaming increases the possibilities. Logical thinking reduces possibilities and makes them conform to the known rules of how things have worked so far. Little children, many of them, are sponges. They are constantly learning. Remember that old saying that people use only a small portion of their brain. Truth is that we use all our brain but there are vast spaces where we have put very little. Use the rooms in your brain as workout centers, not as hallways leading to the same old conclusions. Your brain needs furnishing just like your house. Fill your mind with bright shiny ideas and watch the creativity soar. Apply what you learned one place to somewhere else. A major source of innovation is taking an idea from one area and applying it somewhere else. Creative people find that taking an interest in other aspects of life increases their creativity. Nothing is a failure if you did it. Innovation requires a lot of trying on new things and learning from them. Life experiments need not be failures if you learn from them. Continuing to insist that there is one and only one way to do things keeps you stuck. Consider the risks but make sure you try out new things whenever possible. If you learn from the experiment then it was not failure it was a learning experience. Curiosity did not kill the cat. Stay curious. Contrary to popular sayings curiosity did not kill the cat. Being curious is how the cat catches the mouse. You will never find new things if you always look in the same old places. Cats die not from curiosity but from not looking and missing the oncoming car. Keep your eyes open and looking for the unexpected. What can you make from that pile of stuff? Our modern throwaway culture has encouraged the concept that we need to get rid of things and then get new. Some things do wear out or become obsolete. What we often forget to do is to “repurpose” the things we have. Reuse and repurpose things for creative solutions. Things look different depending on where you are standing. Keep looking from different angles till you see something new. Have a problem or situation that is not working out the way you want it? Try looking at it from all possible perspectives. Ask a lot of what-if questions. Play well with others – be a team. Most of the great inventions we praise as breakthroughs were the result of one person building on another’s work. Creativity is not plagiarizing or copying but it is seeing the merit in an idea and then making your contribution on top of that idea. 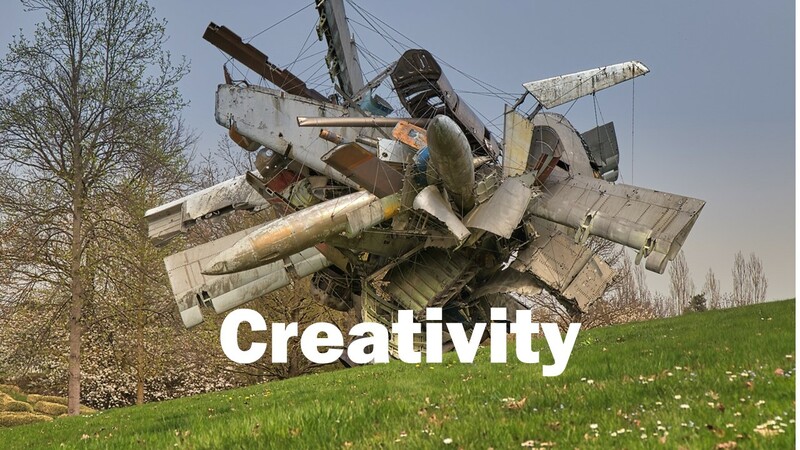 Teams are often more creative than individuals. They can each see things from a new angle with a different knowledge base. 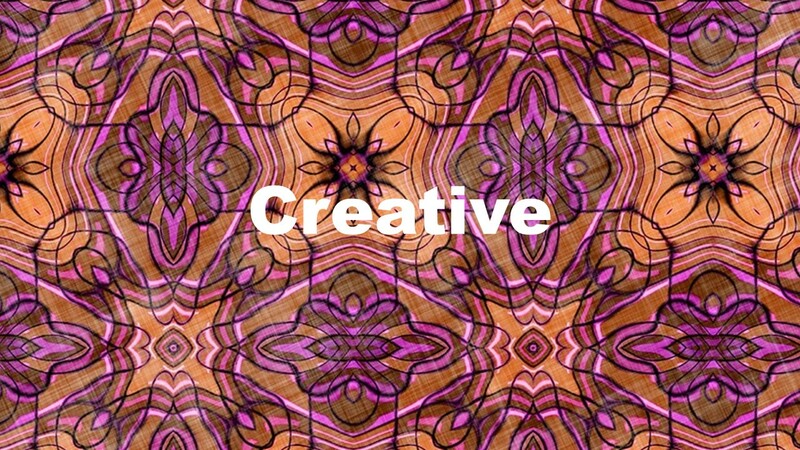 Want to be more creative? Spend some time with other people exploring their ideas and knowledge, then see how borrowing their viewpoint would alter the problem or project you are working on. Don’t censor your thoughts. Let them run free. Birds look a lot different when they are flying than when they are caged. Ideas do not show themselves to the best advantage when forced into rigid rules. Let the idea go where it wants. Do not chase it. Just watch where it goes and make note of how this idea would look if it were allowed to be a free-range idea. Play till you drop. Do not let go of an idea till you wear it out. Most ideas, especially novel ones, have more applications than they ever get allowed to visit. When you see a new idea, yours or one that is just new to you, play with it. Let it explore your mind. How could this idea change things? To think hard you need naps. Pushing harder and longer are OK for routine tasks but for creative endeavors, you need your brain working at peak efficiency. Thinking longer and harder does not maximize new thought patterns. Get plenty of rest, take naps or breaks and learn to practice your self-care. A well-rested mind goes running off in new directions. There are two very different kinds of focus, “pinpoint” or staying on task and diffuse, scanning or looking all around kind of focus. A well-rested mind has the energy to explore new settings and ideas. Go where everything is new. Seek out the new and when you are a child it is all new. Reconnect with your child mind. Novelty promotes creativity. Travel, take a class or explore anything new. Break out of your specialty and explore new topics and disciplines. To maximize creativity learn a new language, or develop a new skill. Take a different route to work or a different mental path. Is there another way to show you that? There is no right way to tell your story, sometimes you need to sing or draw it out. People use different learning styles. Some people learn better by listening, auditory learners. Others learn by seeing, visual learners. Movement, kinesthetic, is the preferred learning system for some. Anytime you process information via a new system you can get different results. Various learning styles make use of different parts and pathways in the brain. For maximum creativity use other parts of your brain. If you read and write a lot try using your visual system and draw out your projects. See if enacting a typical interaction with a client will create new ways of seeing your problem. Doing what you want to do is more fun than doing what others say you have to. People who love what they do are more productive and creative. Looks for a way to make your job fun. Get reacquainted with the things that made you interested in your occupation in the first place. Not finding anything to motivate you? Then it may be time for a hobby or vacation. You may also need to switch assignments or positions. Some people find that a period of time working in a different department or on a different task re-energize them. Sometimes it is just time to get retrained for a new segment of your life. There are some of my suggestions for increasing your creativity and making what you do all those hours we call work more rewarding. Do you have any other suggestions that you could share with the rest of us?